Blepharochalasis is a rare degenerative disease of skin of lids. We report 3 cases of blepharochalasis, out of which two involved upper eyelids and one involved lower eyelids. All the three cases were treated with transcutaneous blepharoplasty with acceptable cosmetic results. Blepharochalasis is a rare degenerative disease unique to the skin of the lids, clinically characterized by primary bilateral swelling followed by progressive loss of subcutaneous tissue resulting in fine wrinkling and the skin of the upper lid hangs in thin folds. It is also termed ptosis atonia, ptosis adipose and dermatolysispalpebrum. Blepharoplasty is the treatment of choice with good cosmetic results. A 24-year-old female presented with history of interference of vision due to laxity of upper eyelids since 6 years. She had several attacks of lid oedema at the interval of 4-6 months which persisted for one day each time since the age of 14 years. For the past 4 years she did not experience lid oedema but developed laxity of skin of upper eyelids. The redundant skin folds extended over the margins of the eyelids. A 23-year-old female presented with right upper eyelid lax skin since the age of 12 years. There was history of on and off edema of right eyelid for one and a half year before the onset of lax skin. A 23-year-old male presented with lax and wrinkled skin of lower eyelid since 4 years. Patient gives history of painless swelling of both eyelids associated with erythema on and off since 13 years. The episodes used to occur daily and used to subside within 2 hours. For the past one year he did not experience any swelling. Patient was a known diabetic (type 1 diabetes mellitus) since 10 years and on treatment. In all the patients there was no laxity of skin elsewhere on the body. Patient 1 and 2 had levatorpalpebraesuperioris muscle weakness resulted in drooping of upper eyelids. The upper lip and thyroid were normal. Systemic examination revealed no abnormality. Ophthalmic examination was within normal limits. All haematological investigations were within normal limits except for case 3 who was a case of type 1 DM. For all the three patients blepharoplasty was done. For first two patients upper eyelid blepharoplasty was done and case 3 underwent lower eyelid blepharoplasty. 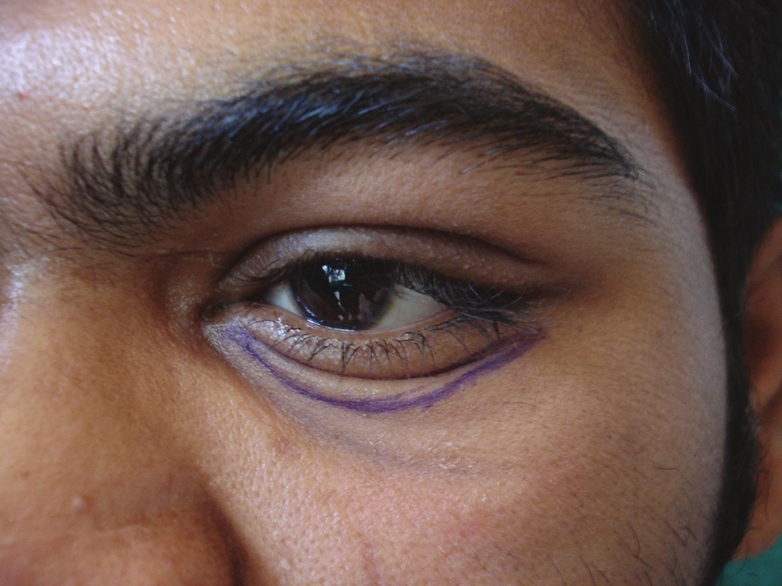 Preoperative markings were made with the patient sitting upright in neutral gaze with the brow properly positioned. The upper eyelid was injected with 2% lignocaine with 1:1,00,000 epinephrine and with the help of a NO 15 Bard Parker blade incision was made along the skin markings. The lower limit of excision was made along the eyelid crease, and the lateral extent of the marking was limited by an imaginary line joining the lateral end of the brow to the lateral canthus. 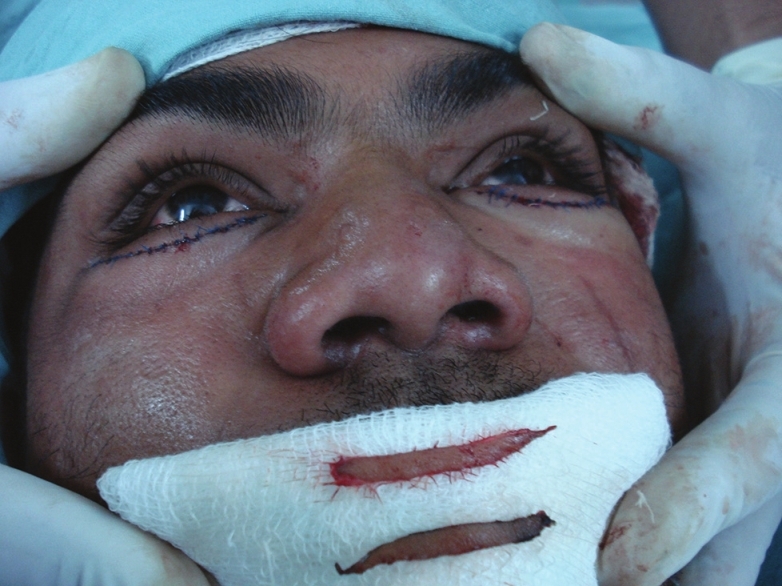 The extent of excision was made upto 10 mm from the inferior border of the browand medial and central fat was excised along with skin and closed with 7-0 absorbable suture [Figure 1]. Transcutaneous lower eyelid blepharoplasty was done by giving an elliptical incision 8 mm below the eyelid margin, excess fat and skin was excised and closed by 7-0 absorbable suture [Figure 2], [Figure 3], [Figure 4]. In all the patients there were cosmetically acceptable results. We report 3 cases of blepharochalasis, of which 2 cases involved upper eyelid (1 case was unilateral) and 1 case involving bilateral lower eyelids. Blepharoplasty is a simple procedure which can be done effectively by a dermatosurgeon. 1. Kumar A, Surwade GA, Khaire US, Shende R. Blepharochalasis. Indian J Dermatol Venereol Leprol 2001;67:216-7. 2. Brar BK, Puri N. Blepharochalasis- a rare entity. Dermatol Online J 2008;14:8. 3. Mercy P, Ghorpade A, Das M, Soud A, Agrawal S, Kumar A. Blepharochalasis. Indian J Dermatol Venereol Leprol 2009;75:197-9. 4. Kar HK, Gautam RK, Jain RK, Yadav TP, Sharma SK. Blepharochalasis. Indian J Dermatol Venereol Leprol 1994;60:353-4. 5. Naik MN, Honawar SG, Das S, Desai S, Dhepe N. Blepharoplasty: An overview. J Cutan Aesthet Surg 2009;2:6-11.